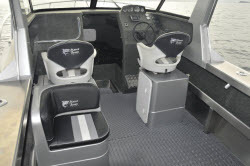 Marco 650HT Souwester Review | Peninsula Marine Ltd. The company was founded by aluminium boat-building pioneer Graham Ransom and purchased by the Horne family – Dayne and his parents Helen and Bryan – in 2003. The Hornes have an engineering background and a history of boat building. The company currently employs seven staff, turning out around 75 boats per year, with around two-thirds of them exported. Marco Boats has a number of dealers (for details see www.marcoboats.co.nz). The Morrinsville factory covers sales in other areas. Marco now produces a much more up-market product than the more basic models originally produced by founder Graham Ransom. 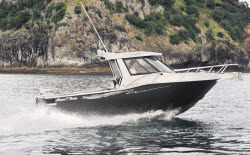 A good example of this is the Marco 650 Sou’wester that I travelled to Tairua, on the Coromandel Peninsula, to trial with Alan Thomsen, Director of Thames-based regional Marco agent Peninsula Marine. Part of a four-model Sou’wester series ranging from 6m to 7.6m, this 6.5mm aluminium hull (7.1m LOA) features 5mm bottoms and transom with and 4mm sides, topsides and chequerplate deck. Deadrise at the stern is 17°, chines are downturned and there are no planing strakes fitted (or needed), which contributes to the softness of the ride. The bottom plates are butted up at the keel line and fully seam-welded inside and out, before a keel bar is seam-welded inside, adding stiffness and helping support the deck. Under the deck are six full-length stringers. Three full bulkheads (including a collision bulkhead in the bow and the transom construction) support the hull laterally, while the addition of partial frames sees the deck supported at roughly 450mm centres. This hull is rated to support six people and 100kg of gear if swamped. The welding appears solid and well executed, and the finish is very smooth; there is nothing like black gloss paint to show up any imperfections. The workmanship is excellent overall and good quality fittings are used throughout. Also available in an outboard version, this 650 is fitted with a Cummins MerCruiser inboard diesel. The QSD2.0-litre is an in-line four-cylinder with a common-rail fuel injection system that includes a turbocharger and seawater aftercooler, turning out 130hp. Married to an Alpha sternleg spinning a 21-inch pitch Ventura four-blade prop, the rig turned out 30 knots (55.6kph) at 4000rpm as a top-end speed while using 28 litres per hour. At a more reasonable cruise speed of 19 knots (35.2kph) at 3000rpm, fuel usage dropped back to 13.1 litres per hour. A troll speed of seven knots was achieved at 2000rpm, using 6.6 litres per hour. Fuel capacity is 140 litres in an under-floor tank. The filler port is located on the outside of the transom wall. Alan Thomsen and I towed the 650 from his yard in Thames to Tairua, where we rendezvoused with his son Rodney and the camera boat. The tide was low, but conditions were perfect for boating – too perfect for much of a trial of the hull’s rough-water ability in fact, as a small lift on the Tairua Bar was the only exception to a pretty much flat-calm sea. We did encounter a slight chop at one stage out near Slipper Island, but I had to resort to running the boat back over its own wake to get an impression of how the hull handled the sea. I can report that the 650 appears to be a soft rider, and that these hulls have a good reputation. It is a bit of a cop-out, I know, however I must take ultimate refuge in the knowledge that nobody in their right mind would spend the dollars that an up-market trailerboat commands without doing their own sea test first. The MerCruiser was certainly smooth and quiet, and the controls a pleasure to use, with a nice progressive tilt/trim and Lectrotab trim-tabs. The helm control was a Steerflex cable system, which handled its task well – the boat goes exactly where you point it and the steering has no tendency to pay off. All-round visibility from the helm is also good through curved, tempered-glass ‘screens, aided by a Roca windscreen wiper on the helm side. To get to the bow, you can either walk around the cabin sides (aftermarket non-skid panels could be added if required) or come through the hatch in the fore-cabin roof. High berths do make this a bit of a crawl. There is probably not a lot of necessity to do either though, as a helm-controlled Quick anchor capstan is permanently mounted with a Sarca anchor on the bowsprit. The capstan feeds through the foredeck to an anchor locker in the bow, which can be accessed through either of two ports in the forward bulkhead, with the top one being adjacent to the capstan’s base. Other foredeck furniture includes: a substantial one-piece bow rail; a crucifix bollard welded to the foredeck; and a Deck Tread strip to protect the paintwork from chain flogging while the pick is being pulled. A good, practical setup. As mentioned, there is not a lot of headroom in the forecabin, but there is underberth stowage, a cabin light, and a central toilet can be fitted if required. Access to the back of the console is through a screw-off plate. Two wide side shelves have padded front faces that do double-duty as back rests; with the infill in place, the berths can sleep two or three adults. The forecabin is lined to deck level, and the step-down drains to the bilge. The open-backed hardtop shelters the helm position, which features a large carpeted dash with a back lip. Seats are upholstered plastic bucket types on nicely made fibreglass pedestals with internal stowage space. The helm side is a single seat, while the passenger side is a king and queen combination featuring a comfortable rear-facing bench and a forward-facing bucket that tilts to disclose a mounting position for a gas cooker. Chequerplate footrests are built in, and side stowage shelves are added to each side, along with a grab rail for the passenger. In addition to the engine gauges and fuel computer, electronics consist of a Uniden UM380 VHF mounted overhead, while a flush-mounted Lowrance Elite5 sounder/GPS handles fish-finding and navigation duties. Other controls include those for the Lectrotab trim-tabs and Quick windlass, with Aquatech switching for lighting, pumps and so on. The rear edge of the open-backed hardtop features a full set of grabrails and fittings for a removable shade canopy that extends back over part of the cockpit. In the cockpit, tube-mat covers the sealed chequerplate deck, which drains to sumps under the transom to either side of the engine compartment. 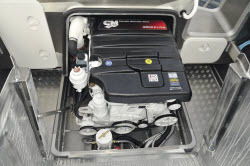 Each is fitted with a 550gph bilge pump, while a third 1100gph pump is fitted inside the engine well. All bilge pumps are manually controlled. Two long side shelves run from the helm bulkhead to the transom, a distance of (very roughly) 3.5m. The engine box does dominate the rear of the cockpit, but is nicely made with no sharp edges, forming a useful worktop. This and the wide transom top are clad in Deck Tread panels. Hatches give access to lockers in the transom wall and the battery (there is room for a twin installation), and isolation switches are housed in the starboard side. A deck-wash hose is fitted to port, where the transom features a step-through with drop-door that leads to the wide transom platform. This steps up in the centre third, also forming the cover for the stern-drive leg. Grabrails, Deck Tread panels and a fold-down boarding ladder, along with tie-off cleats (another pair are situated amidships) complete the back end. Overall, this is a nice clean fit-out, offering plenty of stowage space, comfortable, practical seating, good work space in the cockpit (despite the engine box), no sharp corners to bite you, and some good design ideas. This is a good, stable hull with secure footing on the tubemat-covered chequerplate deck. 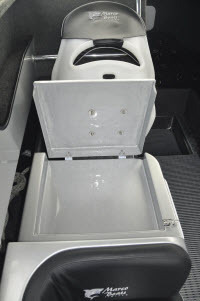 There is top-of-thigh support and toe room, except at the step-through and engine box areas. 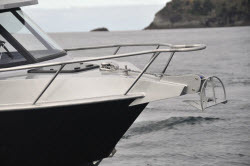 Six alloy through-gunwale rod-holders are fitted along the sides, with gimbal pins in correct orientation for trolling. A six-position rocket-launcher is built on the hard-top. This could take drop-in outriggers if required. 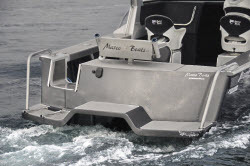 A movable bait-station, with two further rod holders and overboard drainage, can be mounted on the transom top or on the engine box. An aftermarket icebox could take care of catch stowage. The inboard versus outboard debate has pluses and minuses as far as fishermen are concerned. Many game fishermen prefer diesel inboards because they believe the lower frequency engine vibrations help attract game fish – but of course outboard powered boats catch plenty of fish, too. Inboard diesels used to be much cheaper to run when spending long days trolling, but modern outboards – especially four-strokes and DFI two-strokes – have closed the gap. There is weight and cockpit space to consider too, but the new inboards are compact and lighter than previous models. Regardless, Marco caters for both preferences, with inboard and outboard versions of the 650 Sou’wester available. Certainly the test model, with its Cummins MerCruiser QSD 2.0-litre diesel engine, is well suited to game fishing. 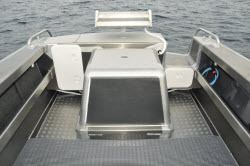 The engine box forms two fishing positions at the stern where stand-up anglers can brace themselves between the side and the box – and without an outboard it is an easier task to secure a gamefish across the stern platform, should you want to take one home. 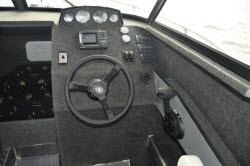 The step-through is on the correct side of the boat, too, so the angler has the transom wall to park their backside on when chasing a fish forward on the helm side of the boat (where the skipper can most easily keep an eye on the line angles). The trailer supplied is a Voyager tandem axle A-18 model with zinc-protected leaf-spring suspension. The hull is carried on six pairs of wobble rollers and one keel entry roller. It is fitted with hydraulic override and park brakes. Other features include: a dual-ratio manual winch; dual coupling; wind-down jockey wheel; and submersible LED trailer lights. Tow weight for the rig is approximately 1900kg. This is a well-made, well-finished, smart-looking and comfortable hull. Fishing and dive orientated, it is available in inboard and outboard configurations to suit the requirements of the owner. This one ticks all the boxes. Test boat courtesy of Peninsula Marine.